Successor to the prophet Elijah. The name (in the LXX. Ελισά, Ελισαιέ; in Luke iv. 27 Ελισ[σ]αῖος) seems to denote "God is salvation," corresponding to the Sabean , and thus be in meaning identical with "Elishua" (II Sam. v. 15); though the latter name may also be interpreted as "God is opulence," which significance König prefers for "Elisha." The son of Shaphat, a wealthy landowner in Abelmeholah, Elisha grew up on the farm until he, though not one of the "sons of the Prophets," was summoned from the plow by Elijah. Thereupon, after kissing his father and mother, and making a sacrificial feast of his oxen for the people, he followed Elijah, his "master" and "father," upon whose hands he poured water (I Kings xix. 16, 19-21; II Kings iii. 11), i.e., as a servant. In the expedition against Mesha, King of Moab (II Kings iii. 4), the Israelitish army was saved through Elisha's advice from perishing by thirst; and Moab, mistaking, under the glare of the sun, the water in the trenches for blood, was lured to an ill-conceived attack and defeated. During the Syrian war (ib. vi. 8 et seq. ), Elisha's counsel defeated the strategy of the hostile king, who, desirous to capture the prophet, sent out horse and foot against him, only to find that the would-be captors were themselves tricked to accompany their expected captive into Samaria. Samaria, besieged by the Syrians and in dire distress from famine, was cheered by his prediction of the raising of the siege (ib. vii. 1-2). Elisha, by announcing to Hazael his impending succession to the throne, was perhaps the innocent cause of Benhadad's assassination (ib. viii. 7 et seq.). By his direction one of the sons of the prophets anointed Jehu as king, with the purpose of dethroning Joram and of destroying Ahab's dynasty. His last act was his prediction to King Joash, who visited him when on his deathbed, that he would be victorious over the Syrians (ib. xiii. 14-19). Miracles. (II Kings xiii. 20, 21; compare Ecclesiasticus [Sirach] xlviii. 13-15). Elisha resided for the most part in Samaria, paying Jericho and Bethel, where the prophetic settlements were, an occasional visit (ib. ii. 25, v. 3). Elisha having received a double portion of the prophetic spirit, is held to have worked twice as many miracles (16) as Elijah (Ḳimḥi to II Kings ii. 14). While Elijahrestored one person from death, Elisha restored two—the son of the Shunammite woman, and Naaman, who, being a leper, was considered as one dead (Ḥul. 7b; Sanh. 46a). From the incidents of Elisha's life a number of halakic precepts are derived. Indeed, both Elijah and Elisha are considered great rabbinical masters. Thus, on their last journey together they held converse, according to one rabbi, on the Shema'; according to another rabbi, on the consolations for Jerusalem. Others assert that their conversation concerned the mysteries of creation; the majority maintain that they were discussing the mysteries of the chariot (Yer. Ber. 8d; comp. Soṭah 49a). This was in due observance of the rabbinical dictum that "two students who walk together without discussing the Torah deserve to be burned" (Soṭah 49a). Indeed, an angel had been sent to destroy master and pupil, but finding them occupied in the study of the Torah, the Prophets, the Hagiographa, the Mishnah, the Halakah, and the Haggadah, he lost his mastery over them (Tanna debe Eliyahu, v.
Anger deprives a prophet of his divine gift, as Elisha experienced (II Kings iii. 14, 15). God's spirit rests only upon those who are in a peaceful and joyful mood (Pes. 66a, 117a; Yer. Suk. 55a, bottom). The harp that induced Elisha's inspiration played, it would seem, without the touch of the musician (Pesiḳ. R., ed. Friedmann, p. 86a). From, Elisha's refusal to receive the King of Israel it is deduced that one should not look upon the face of a wicked man (Yalḳ. to II Kings iii. ; Meg. 28b). His having "poured water upon Elijah's hands" is made the text for enlarging on the benefits derived by disciples from ministering to great masters (Ber. 7b). The hospitality of the Shunammite woman is referred to as typical (Cant. R. ii. 5), and as showing that a woman always knows the character of a guest better than a man does (Ber. 10b). The Rabbis take pains to account for his calling the bears to devour the children, by ascribing the coming of the bears and the appearance of the woods which had not been seen before to his miracle-working power (Soṭah 46b, 47a, Yalḳ. to II Kings ii. 21). The offenders were not children, but were called so ("ne'arim") because they lacked ("meno'arin") all religion (Soṭah 46b). The number (42) rent by the bears corresponds to the number of the sacrifices (42) offered by Balak. Had the Bethlehemites shown him due courtesy by sending him on his way attended in a manner befitting his dignity, this incident would not have occurred (Soṭah 46a). Yet Elisha was punished for this act as well as for his rude treatment of Gehazi (Sanh. 107b). The man whom he revived from death, according to some, did not live for more than one hour; this was to show that the wicked should not be buried with the righteous (Sanh. 47b; Pirḳe R. El. xxxiii.). Shalom ben Tiḳwah was the name of the man revived by Elisha's bones; according to some he did not die immediately after, but lived (II Kings xxii. 14) and begot a son, Hanameel (Jer. xxii. 7). Elisha was a prophet for over sixty years, according to Seder 'Olam. xix. and Yalḳ. to II Kings xiii. 20. Pirḳe R. El. (l.c.) 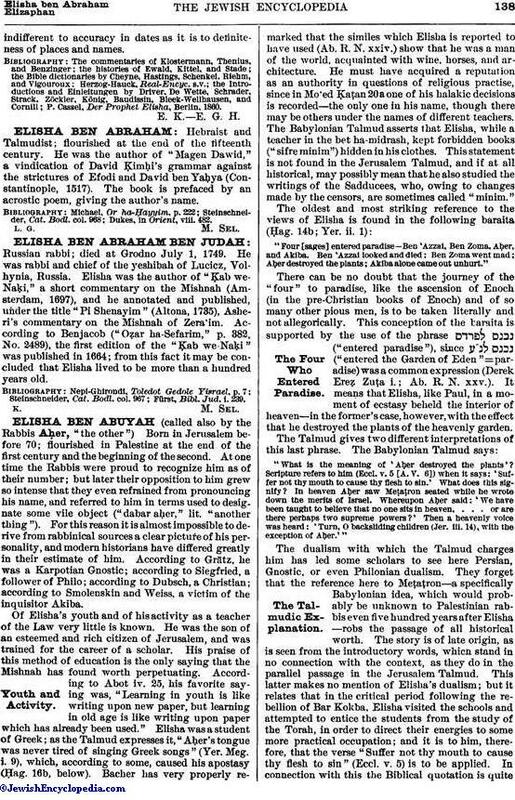 reports, in the name of R. Joshua ben Ḳarḥah, that any woman who saw Elisha would die. The Shunammite was the sister of Abishag, the wife of Iddo, the prophet. When she repaired to Mount Carmel to seek the intervention of the prophet in behalf of her son, Gehazi, struck by her beauty, took undue liberties with her. Elisha sent his servant with his staff bidding him not to speak with any one; but Gehazi, being a skeptic and a scoffer, disobeyed the injunction. As in the case of Elijah, the critical school holds that the account of Elisha's life and activity is taken from an old cycle of Elisha stories current in various versions before incorporated into the Books of Samuel-Kings. The contents are characteristic not of a book of history, but of one of legends, miracles being the main preoccupation of the prophet. The purpose of some of the accounts is clearly that of exalting the authority of the prophetic order and of inculcating obedience to and respect for it. The Elisha cycle is a clear imitation of the Elijah book. The miracles performed by Elisha have the appearance of being duplicates of those which are credited to his master, with obvious efforts at heightening them. Of this kind are the widow's oil, the revival of the child, and the anointing of Hazael and Jehu. Even from a literary point of view the Elisha biography reveals the hands of imitators. Each of the prophets is ostentatiously designated as the "man of God"; the names of the kings are mentioned only incidentally; and in the few cases where they are found, it is probable that they were inserted later. This is characteristic of legends: names are always secondary considerations. The Elisha cycle is a bundle of anecdotes loosely strung together. Contradictions therefore occur, as might be expected; e.g. , II Kings v. 1 contradicts ib. vi. 8. Peace is said to be between Israel and Damascus in the former, war in the latter passage; v. 27 makes Gehazi a leper; nevertheless in viii. 1 he appears without any further ado before the king. The shifting of Elisha's places of residence points in the same direction, and so does the circumstance that Gehazi is now a very important personage (iv. 8, viii. 1), and now of little consequence (iv. 8, v. 1). Again, some of the stories are altogether without historical material, while others, notwithstanding their legendary character, give historical notes of value (iii. 1, vi. 24, viii. 7, ix. 1). 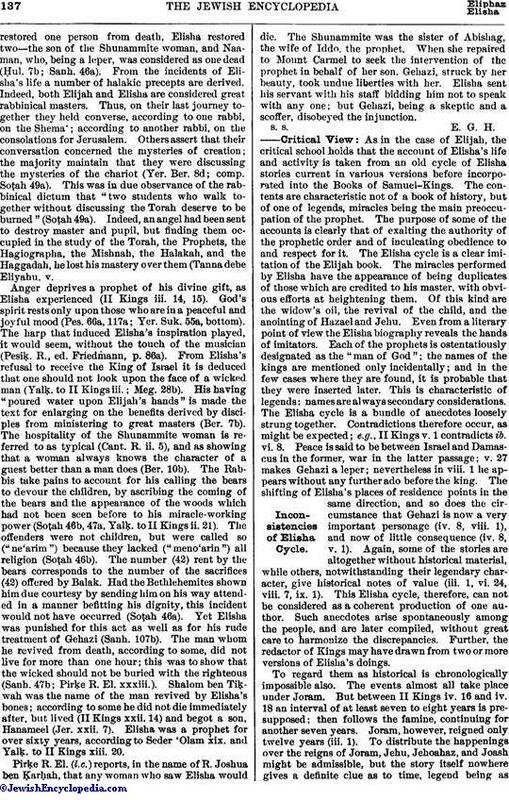 This Elisha cycle, therefore, can not be considered as a coherent production of one author. Such anecdotes arise spontaneously among the people, and are later compiled, without great care to harmonize the discrepancies. 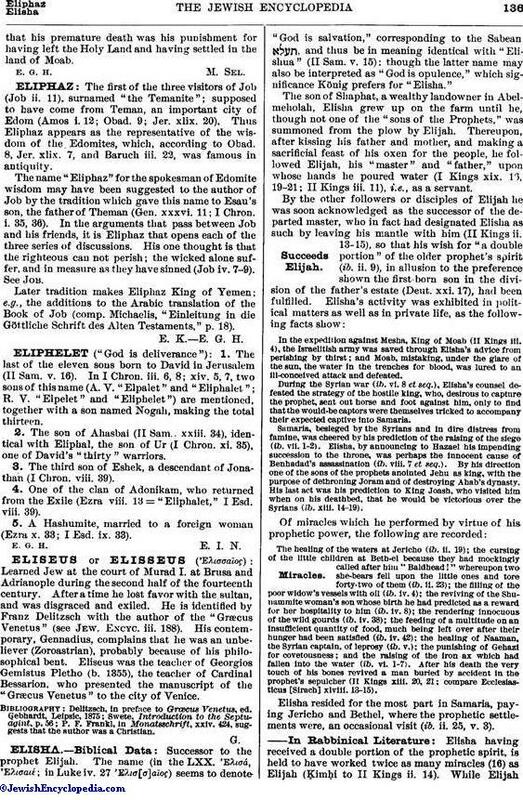 Further, the redactor of Kings may have drawn from two or more versions of Elisha's doings. To regard them as historical is chronologically impossible also. The events almost all take place under Joram. But between II Kings iv. 16 and iv. 18 an interval of at least seven to eight years is presupposed; then follows the famine, continuing for another seven years. Joram, however, reigned only twelve years (iii. 1). To distribute the happenings over the reigns of Joram, Jehu, Jehoahaz, and Joash might be admissible, but the story itself nowhere gives a definite clue as to time, legend being asindifferent to accuracy in dates as it is to definiteness of places and names. the Bible dictionaries by Cheyne, Hastings, Schenkel, Riehm, and Vigouroux. P. Cassel, Der Prophet Elisha, Berlin, 1860.